Brosa ovala vintage, model floral cloisonne. Se prinde pe spate cu ac si clema cu siguranta. Provenienta Italia. Masuri: circumferinta - 12 1/2. Dimensiuni medii. Despre: "Cloisonné is an ancient technique for decorating metalwork objects, in recent centuries using vitreous enamel, and in older periods also inlays of cut gemstones, glass, and other materials. The resulting objects can also be called cloisonné. 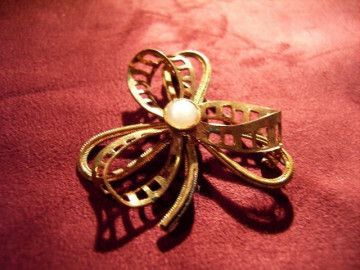 The decoration is formed by first adding compartments (cloisons in French) to the metal object by soldering or adhering silver or gold wires or thin strips placed on their edges. These remain visible in the finished piece, separating the different compartments of the enamel or inlays, which are often of several colors. 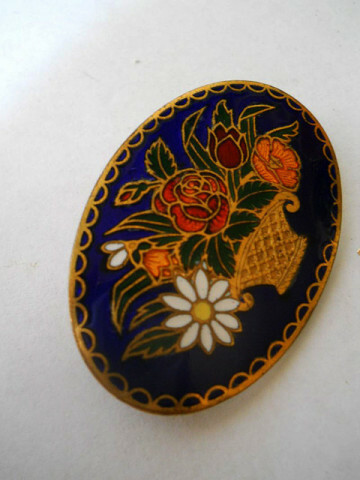 Cloisonné enamel objects are worked on with enamel powder made into a paste, which then needs to be fired in a kiln. 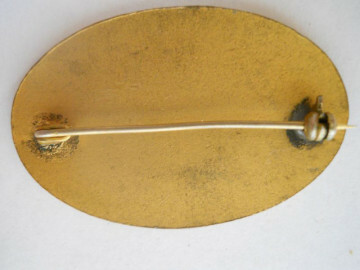 The technique was in ancient times mostly used for jewellery and small fittings for clothes, weapons or similar small objects decorated with geometric or schematic designs, with thick cloison walls. In the Byzantine Empire techniques using thinner wires were developed to allow more pictorial images to be produced, mostly used for religious images and jewellery, and by then always using enamel. 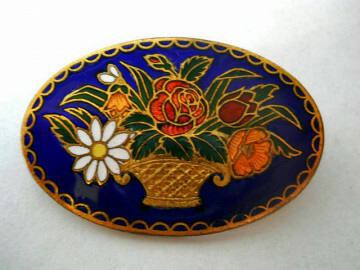 By the 14th century this enamel technique had spread to China, where it was soon used for much larger vessels such as bowls and vases; the technique remains common in China to the present day, and cloisonné enamel objects using Chinese-derived styles were produced in the West from the 18th century." (Sursa: Wikipedia).